The species primarily occurs in open grassy plains and dry steppe, but also in light woodlands and desert areas (Van der Walt, 1986; East, 1988, 1989; Mills & Hes, 1997). The Name "Oryx": "Oryx" comes from the Greek word "orux," meaning "pick-axe" (horns). 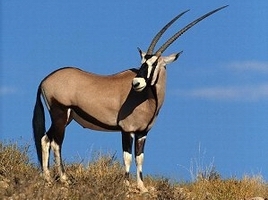 "Gemsbok" is the Afrikaans (South African Dutch) word for the animal meaning "chamois buck." "Beisa" is unknown, but is probably the native African word for the animal. This is a powerful-looking antelope with a well-defined pattern on the head and body. On the face, there are three black stripes alternating with three white ones. There is a black stripe running down the center of the back. The white underside is separated from the gray flanks by a black line. The tail is long and has a black tuft. The horns are nearly straight and almost parallel, and average about 30 inches long. The female's horns are usually longer and slimmer. There are two distinct races of gemsbok: a northern form which often has its ears fringed in black, and a southern form with longer horns, rounder ears, and a darker rump. Length of head and body is up to six feet, shoulder height about 4 feet, and it weighs up to 450 pounds.